Call and Mention Promo Code: ORANGE to get 25% off your Coolsculpting treatment plus an exciting bonus gift! Lock in your 25 % discount now and reveal your special bonus gift by filling in the info below. Write "ORANGE" and your contact phone number so one of our Coolsculpting consultants can contact you. We have performed over 800 Coolsculpting treatments. Experience matters. Just like liposuction, there is definitely an art to sculpting the body with Coolsculpting. We have 3 Coolsculpting university Graduates. Our Coolscultping technicians have the highest training and work directly under the supervision of our physician. We have two Coolsculpting Machines. Two machines means you can be done with your treatment in half the time! We have all the newest Coolsculpting applicators. Older machines and even counterfeit machines are out there. Don't be fooled. Omni Aesthetics has all the latest technology for the best results. There is only one Omni Aesthetics. We are celebrating our 10th year in the aesthetics field and our 5th year performing Coolsculpting. The skill and experience of your Coolsculpting technician will make a huge difference in your outcome. Poorly trained technicians delivering the treatment can give you uneven fat reduction that may need to be retreated or may even require surgical intervention to correct. At Omni Aesthetics we have 3 Coolsculpting University graduates performing the treatment with Dr. Song on premise to evaluate any medical issues before during and after your treatment. Coolsculpting is a patented technology with very sophisticated mechanisms to prevent frostbite and other complications. Counterfeit devices with similar sounding names are NOT the same. The latest version of the Coolsculpting device is safer and much more effective compared to the older models that are still being used by some clinics. At Omni Aesthetics, we keep our system updated with the latest applicators that can treat the fat in half the time and we have two machines so we can treat two areas at a time. Your time is valuable and we respect that! To help ensure that you get the best and the fastest results, we can break up the frozen fat with our acoustic wave therapy. 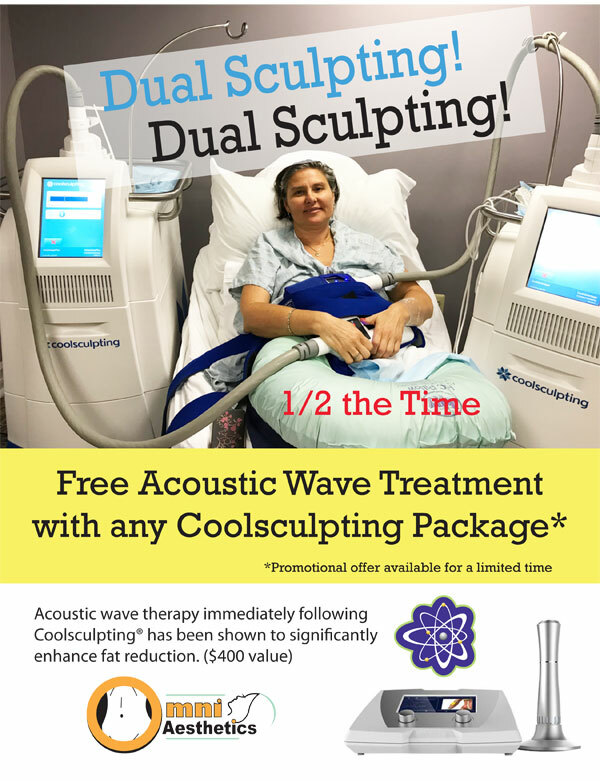 For a limited time we are including an acoustic wave treatment for free with each Coolsculpting cycle, a $400 value! CoolSculpting may not be for everybody. If you have a lot of fat to remove, you may get better results with liposuction. We have the most advanced liposuction technology including Tickle lipo, SmartLipo and the ultimate in skin tightening: Renuvion Lipo. We also have other technologies such as Sculpsure laser, BodyFx, Kybella and Smoothshapes. Come in for a consultation to find out which treatment is best for you.